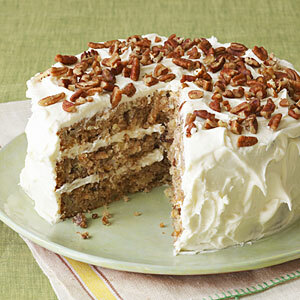 A Hummingbird Cake recipe is found in many Southern cooks’ recipe boxes. One of the most popular of southern desserts, this cake is a perfect ending to any dinner. Often called the Cake that Doesn’t Last, there is seldom any left over. A homemade cake recipe using cinnamon, pecans, bananas and pineapple, this makes a moist cake that is especially delicious with creamcheese frosting. Make this cake a day ahead, if you can resist the temptation. An easy cake recipe that requires only one bowl, this recipe can be made as a sheet cake or Bundt cake. The most festive presentation is a three layer cake. 1. Preheat oven to 350 degrees F. Grease and flour three 9-inch round cake pans, 10-inch Bundt pan or 13 x 9-inch baking pan. 2. In a large bowl, combine flour, baking soda, salt, sugar and cinnamon. Add eggs and oil, stir until dry ingredients are moistened. Do not beat. Stir in vanilla, pineapple, 1 cup of pecans and bananas. 3. Pour batter equally into 3 pans. Bake for 25 – 30 minutes or until a wooden toothpick inserted into center comes out clean. Cool in pans on wire rack for 10 minutes. Remove cakes from pans and cool completely. 4. Prepare Cream Cheese Frosting. Combine cream cheese and butter, beat until smooth. Add powdered sugar and vanilla, beat until light and fluffy. 5. Spread creamcheese frosting between layers, on top and sides of cake. Sprinkle 1/2 cup chopped pecans on top.